Power a fountain, add moving water to piped statuary, or circulate water in your small pond using the Little Giant Manual Submersible Pump. This durable, submersible unit is perfect for use in a container garden or other small reservoir, and its compact size makes placement simple. The bottom, screened intake allows plenty of water to reach the motor, and may be periodically removed for maintenance or cleaning. 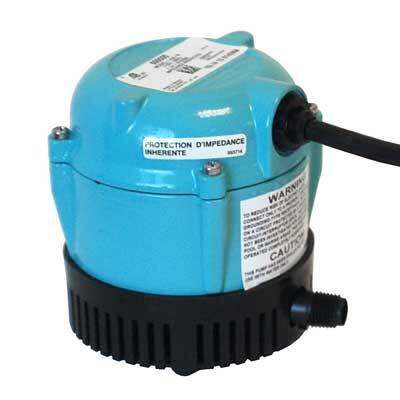 Epoxy-coated, aluminum housing creates a lasting pump, and the oil-filled motor is specifically designed for continuous, submerged use. This ensures the pump remains cool when running, for safe and consistent operation. The outlet accepts 1/4" FNPT fittings, and an included elbow helps you direct your tubing. Another included adapter securely connects to a standard garden hose, allowing you to use the pump for water transfers. Its 18' long cord makes it easy to submerge this pump in a few different locations, while its grounded plug ensures safe operation. Add moving water to a statue or showcase a fountain in your garden with this Manual Submersible Pump. Two year limited warranty.